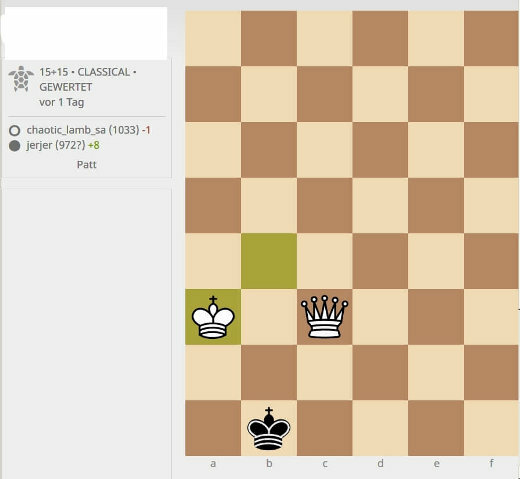 I just played a game where I forced my opponent into a position where he could not make any valid move and therfore Stalemate. I had my Queen and King, my opponent only his King. Why was my end score -1 and my opponents on +8? A answer no matter how brief would be appreciated. it is quite simple. You had a higher rating than your opponent so you were expected to score higher. You achieved a draw only against a lower rated opponent so you lose 1 rating point. The ratings of you and your opponent are very close so you don't lose many points. Your weaker opponent achieved a draw against a higher rated player so his rating goes up 8 points. If your opponent would have been rated much lower than you, your rating would have dropped quicker. If your opponent would have a higher rating than you and you make a draw, then your rating would go up in spite of the fact that you achieved a draw only. Example: If you would have achieved a draw against a grandmaster you would have gained a lot of rating points. Rating calculations are very complicated.